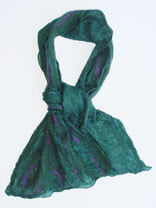 To make this scarf, take a long strip of roving and stretch it width wise until it is a very thin see through sheet. Lay these stretched strips of roving lengthwise on the scarf in a single layer covering the entrire scarf. Add very fine thin wisps of contrasting roving in a stripe pattern. The scarf was felted with a sander and fulled by bunching and throwing. Finished size: ~ 12" x 60"